full color, custom imprint, both sides. 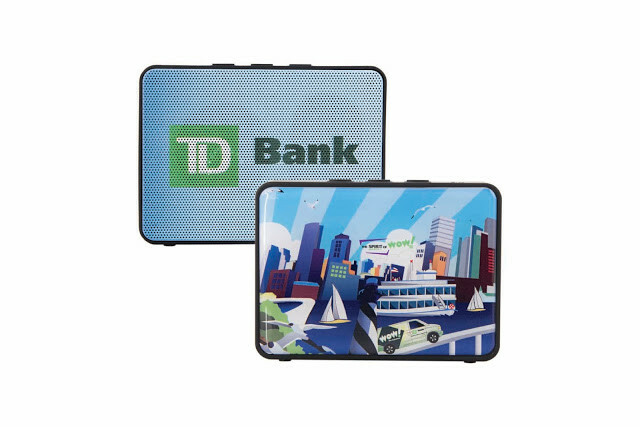 With full color imprinting capable on both sides of these powerful little speaks, we might have located the perfect Summer time promotional product in the Boxanne Bluetooth speaker. Take a look at the Boxanne in action in the video below. From the manufacturer, “Take the party wherever you go with Boxanne, a lightweight and portable Bluetooth speaker that fits in your pocket. Customize the greeting when Boxanne turns on at 500 pieces. Please contact us at info@proformagreen.com if you would like more information on – or samples the Boxanne Bluetooth speaker. ← When It Comes To Drones, What’s All The Buzz About?